For more than three decades, Front Line Assembly has risen to become a name virtually synonymous with the electro/industrial genre. Each album integrates new sounds and styles to maintain a constant evolutionary flow, all the while retaining the core thematic elements that have made the band a consistently satisfying and trailblazing entity. With Wake Up the Coma, the duo of Bill Leeb and Rhys Fulber have crafted, with the assistance of a regular contingent of collaborators and some notable guest performers, one of FLA’s most varied sonic offerings, providing a soundtrack to what was once the dystopian future of 2019. Themes of sociopolitical unrest and technological upheaval remain at the forefront of the group’s outlook, with introductory single “Eye On You” beginning the proceedings with a diatribe on government surveillance and the ensuing paranoia of its citizens; with the assistance of Robert Görl of legendary EBM and electropunk act D.A.F., the track starts the album off with throbbing atonal sequences offset by Leeb’s signature rasp, wisps of ambience giving the track a cinematic grandeur in the simple yet striking chorus. From this track alone, the DNA of FLA’s past can be strongly detected, with later tracks following suit. For example, “Tilt” enters with a buildup of slow breaks and punchy electronics, with both this and the celestial and trancelike arpeggios of “Negative Territory” topped off by Leeb’s vocals harmonized by vocoders and string swells reminiscent of those heard on an album like Epitaph, while the thrusting dance floor beats and seething mechanical ferocity of “Living a Lie” would not be out of place on Hard Wired. Of course, this is not to say that FLA is relying strictly on tried and true methods; on the contrary, all of these signatures are refined with modern production sensibilities to keep Wake Up the Coma planted firmly in the present. One need look no further than the epic and enigmatic title track for proof, as Paradise Lost vocalist Nick Holmes infuses his own melodic style into the song’s already foreboding atmosphere, with his refrains of “Welcome to the edge of the world” proving one of the record’s catchiest moments, augmented by the sparse and crunchy stabs of Lange’s guitar. The specter of Jeremy Inkel is felt on “Mesmerized” with its subtle glitch effects and vocal manipulations amid an insistent dance beat, and on “Structures,” whose synth hooks sparkle with the sheen of modern synthwave to result in what may be one of FLA’s finest tracks in this writer’s opinion – a glowing tribute to the innovative spirit of the band’s fallen comrade. On the subject of synthwave and tributes, there is the cover of “Rock Me Amadeus” with Mindless Self Indulgence front man Jimmy Urine channeling Falco perhaps a little too perfectly. Its placement on the album – especially as its third track – seems dubious to this writer for while it’s exceptionally well done, it does feel somewhat detached from the rest of Wake Up the Coma. On the other hand, Chris Connelly helps to bring the album to a dramatic close as he lends his distinctive croon to “Spitting Wind,” his multilayered harmonies working in tandem with lushly resonant pads, entrancing pianos, Matt Lange’s steely acoustic guitar, and intricate drum programming. 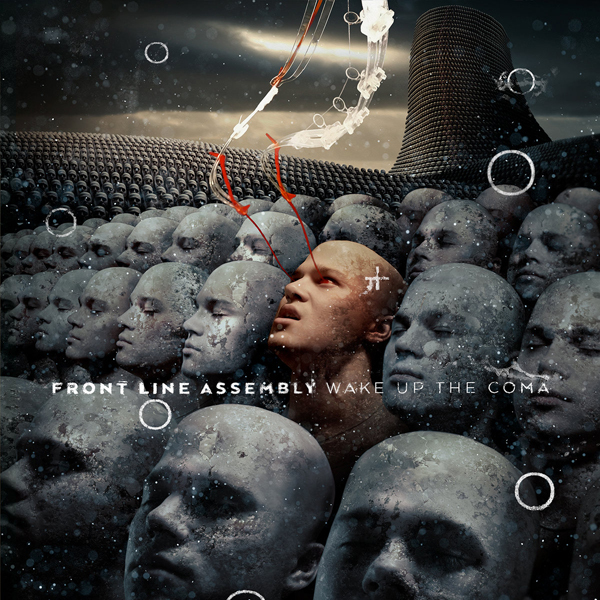 With additional songwriting and instrumental contributions from regular associates like Jared Slingerland, Sasha Keevill, Craig Johnsen, Ian Pickering, and Jeff Swearengin, along with the guests that appear on this album, it makes sense that Wake Up the Coma turned out as diverse an album as Front Line Assembly has ever created. And yet, with all of the disparate sounds and styles that the band explores, FLA manages to retain a level of cohesion and consistency that could easily place it alongside any past glories, and that is no small feat after 33 years.